Success! After a few quick modifications, the module worked great. Well except for the one line that I haven't yet hooked up because I am using a 7 transistor darlington array instead of an 8 transistor version. I like the feel of the module in the hand but plan on cutting the corners in the final design to reduce the risk of the user cutting their hand on a sharp edge. Above are the images of v0.2 and as you can see there has been some basic reworking done to the board. First and most importantly I had to replace my original TO-92 78L05 with the TO-220 package because my circuitry required more than 100 mA which I had overlooked. 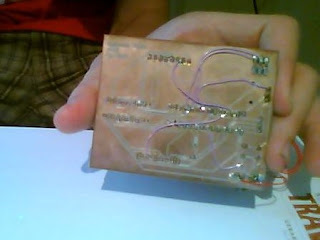 Also I designed the board to be two sided, but because I can't do through plating at home I had planned on top-soldering. This turned out to be very difficult for some components. So I gave up on that and just soldered wire-wrapping wire in place of the top traces. With this module, I finalized the code and thankfully included an ICSP header to program the board which made life a lot easier. 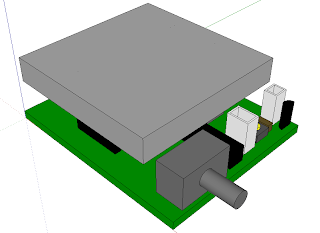 After I got a basic design working I wrote a Processing sketch to upload new designs to my module via the serial connection. The next step for this project will be to order the parts for the modules and then send out the board design to be manufactured. 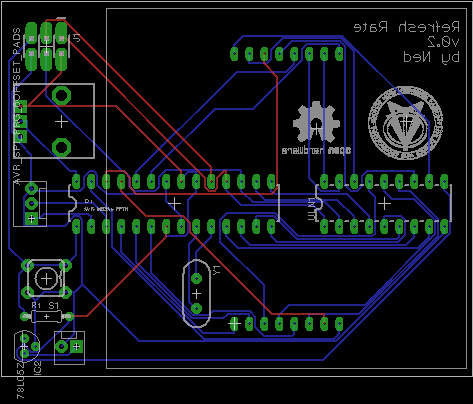 After all of that is done, I will finalize the design for the programmer and manufacture that. I designed and built my first prototype of the refresh rate teacher and big surprise, it didn't work. I designed my prototype in EAGLE and printed a board out in the PCB mill in my school. The PCB mill in my school however does not through-plate the holes and vias in the boards and doesn't silk screen. This can pose an issue with having double layer boards because you have to solder both sides of the board, which can be very hard for things that don't have the pins visible on the top like headers and IC sockets. So I designed my board with this in mind and made sure to limit the amount of top traces and when I did have one I made sure it went to an accessible pin. I also made sure to design the board to be compatible with parts offered at my school so I could prototype as fast as possible. I first made a quick mock up of the design to visualize how everything would fit and also to sell to the leaders of this museum project. I found that they were impressed with being able to see what design I had in my head and it was much more effective than me just describing it. 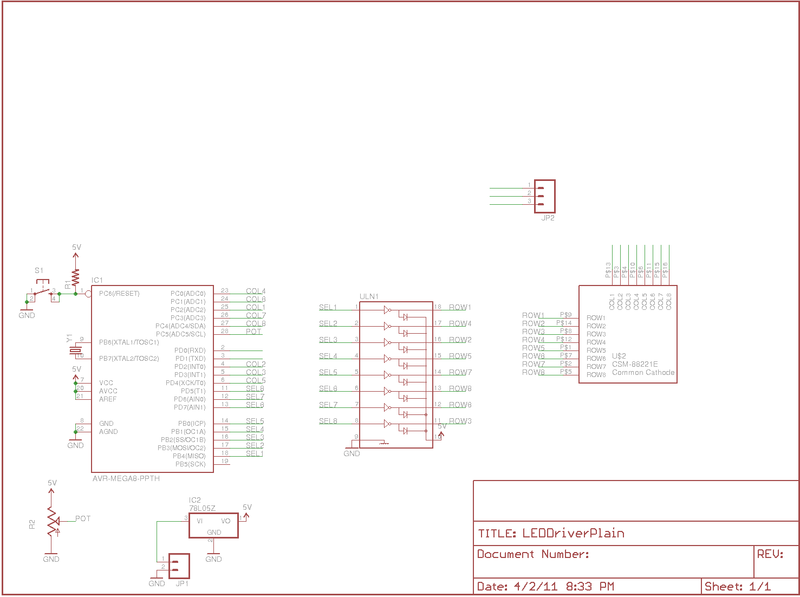 As you can see in the design, I wanted to design a backpack device in which the LED matrix would sit on top of the circuit creating a nice handheld device. Also I will use polarized headers to make sure that users can only plug the wires in the correct way. This is where I made my big mistake in the circuit. I overlooked the fact that I was using an NPN darlington array to control the select side of my LED matrix and used them instead as if they were PNP which made the whole circuit pretty much worthless. Also you may notice that there was no ISP header to program the AVR chip and that was because I am currently using the Arduino platform and you can program just using the serial port and reset. However, this proved to be more difficult than it was worth so my next design will have an ISP header. 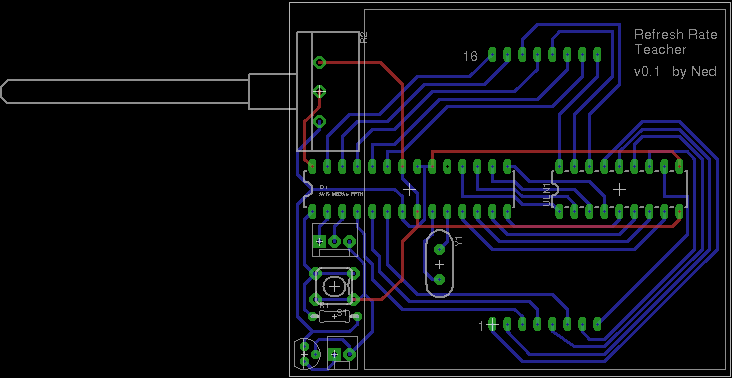 Above is the PCB design for the board and I manually routed it to minimize the number of top traces. However I did route some top traces to the AVR chip which meant I couldn't use an IC socket which in the end was too bad because I ended up wasting an ATMEGA. I have learned several things from this prototype, one is always use an IC socket to minimize wasting expensive chips, include an ISP header especially when you are still developing the program, and always make sure you double check the datasheet of darlington arrays! I also learned a little bit more about soldering finding that all this time I had been using a solder wick incorrectly. I found that to use one effectively you place it over the solder joint you want to get rid of, heat it up, and then add a little solder to the top of the wick and then presto! the solder is gone. Soon I will post my progress on the second prototype and hopefully I will have a video to demonstrate it. Currently I am working on a project for a group that is making a "museum without walls". The idea is to create mobile exhibits that can rotate around several elementary schools and educate students in science. My school is designing and building three of theses exhibits. Each exhibit has a unique theme and the exhibit I am working on is physics and engineering. There are several people involved in this exhibit and each one of us are working on a specific part to it. The idea is that a teacher will have a variety of activities they can show ranging from experiments to demos. Currently, the ideas for the things inside the exhibit are a kit to build a basic motor, a setup to demonstrate the mechanical advantages of pulleys, a setup to teach binary, and modules to demonstrate the refresh rate. I am in charge of the last project and will document in the blog my progress on it. The idea of the project is to teach students how their TV's and computer screens work. The idea is to allow students to upload a design they make on a programming station to a module they can take to their desk. At their desk, they can adjust the refresh rate with a potentiometer and see how the display scrolls line by line and as it speeds up it looks like their image due to persistence of vision. Currently, I am designing the modules that they take to their desks and will design the programmer in the near future. 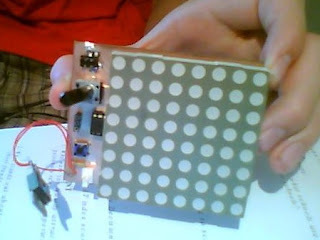 The modules are based on the Arduino and display on an 8 x 8 LED matrix. I am currently in the prototyping phase and will post my designs and pictures soon. For the programmer, I am planning to use a dual-color 8 x 8 LED so the user can highlight the LEDs and select the ones they want to turn on. 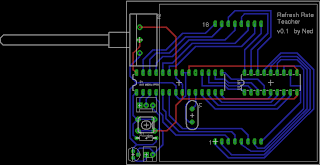 The new design is uploaded to the modules using a serial connection and is loaded into its EEPROM so it can be remembered if it is reset or turned off.